In a large frying pan, heat 4 tablespoons of the oil over moderate heat. Add the bread crumbs and cook, stirring, until golden, about 5 minutes. Remove. Wipe out the pan. Heat the remaining 4 tablespoons oil in the same pan over moderately low heat. Add the garlic, parsley, and red-pepper flakes. Cook, stirring, for 1 minute. Stir in the anchovy paste. Remove from the heat. In a large pot of boiling, salted water, cook the linguine until almost done, about 8 minutes. Add the cauliflower and bring back to a boil. Cook until the cauliflower and pasta are just done, about 4 minutes longer. Drain. Toss with the garlic mixture, salt, bread crumbs, and Parmesan. Top with additional Parmesan. Substitute broccoli for the cauliflower. Add a handful each of raisins and pine nuts at the same time as the garlic, parsley, and red-pepper flakes. 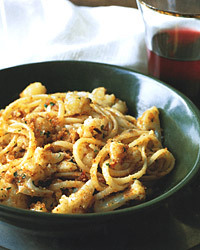 Use four chopped anchovy fillets instead of the anchovy paste. Red wine, if it's simple and crisp, makes an intriguing choice for this dish. A touch of earthiness, such as you'll find in a basic Chianti, helps to tie the wine and food flavors together.